I've been in the privileged position to work for a company that supports and encourages 'smart working' for the past 13 years. Over that period, I've increasingly worked from my home in Worcester even though my 'base office' is over 100 miles away in Reading. Working from home is not as easy as it sounds; it takes practice, discipline and financial investment. However, when you get it right, the rewards are huge; it can increase your productivity and massively improve your work/life balance. These are some top tips for things that I believe will make you a more effective home worker based on being one myself for the past 10+ years. If you work from home with any regularity, you really should have a dedicated office space. I'm lucky to have an out-building in my current house which is exclusively used as an office but in previous houses I've converted part of a garage to an office or had dedicated rooms within the house as an office. I've also considered garden offices which may be an option if you have the space and budget for it. The key thing about having a dedicated space is that you can 'close the door' on it when you are not working. This is really important to be able to draw a distinction between work time and personal time, it helps you go in and out of 'work mode'. A dedicated space is doubly important if you have family and children at home; you'll need a way to shut them out when you are working to avoid interruptions and help them understand that although you are at home, you are still working. I've often thought about building some kind of 'busy light' which shows green or red depending on the free/busy status of my calendar so that everyone else can see if it is OK to come into the office or not. I've not built it though ..... yet! It is very easy to simply roll out of bed, make a coffee, switch your laptop on and start working. I've always avoided doing this. I've always made sure that I treat the start of my day like any other working day and got properly dressed, had breakfast, do any household jobs etc before I start work. You should also consider the transition from you home environment to your office like a sort of commute ... take the things with you that you'll need for the day 'at work' i.e. phone, wallet, snacks etc. This will once again help you transition in and out of 'work mode' (also being dressed helps with video calls which I'll talk about later). Working from home certainly gives you more hours in the day but it is important that you take regular breaks, just like you would do if you were in an actual office. If anything you should take more breaks because you don't get that 'background banter' that you get in an office. It is perfectly fine to spend 20 minutes on the Xbox, do the washing, prep your evening meal etc during the working day. A break away from your work helps give you brain some downtime as well as giving your eyes and body a chance to rest away from your desk; all of this makes you more productive overall. I take a break roughly every 1.5 hours. I find that I naturally get into a cycle during my day but if you struggle with this you may want to look at productivity techniques such as the Pomodoro technique which help you take structured breaks away from work. Your employer has most likely invested a lot of money in fancy ergonomic chairs, professional desks and good internet connections in their offices and there is no reason why your home office should be different. 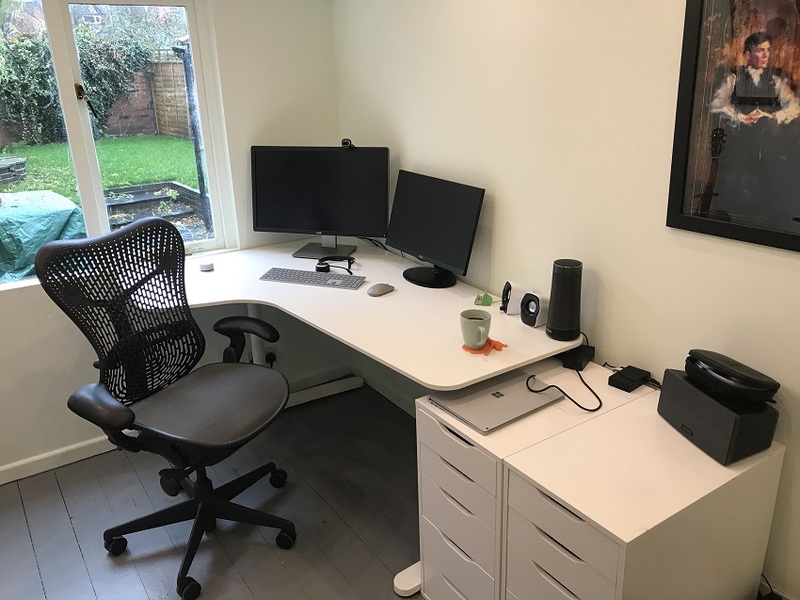 If you primarily work from home, you could spend up to 25% of your life in your home office so invest in it the same way you would with other parts of your house. A good, ergonomic desk. Consider a standing or adjustable desk? I use an Ikea Bekant Desk which is OK, but I am sure there are better ones out there. A good, ergonomic office chair. You can get really good second hand chairs such as for relatively cheap on eBay. I use a second hand Herman Miller Aeron. Either a docking station for your laptop or a desktop PC. Don't use the laptop screen, keyboard or touchpad on a long term basis, it is not good for you. I use the Microsoft Surface Dock which is superb. A large monitor(s). I use a second hand Dell P2715Q 4K 27" monitor with a smaller old LG monitor as a second screen. A bigger screen will make you more productive and is better for your eyes. A proper keyboard and mouse. I use Microsoft Surface Bluetooth Keyboard and Microsoft Surface Bluetooth Mouse, bot of which are excellent. A decent speaker or set of headphones. I use a Sonos Play 3 but seriously considering the new Surface Headphones as they would double up as a headset too. No matter if you use Skype, Teams, Google Hangouts, Zoom or some other real-time collaboration technology, most companies have something that lets you do voice and video conferencing, but in most cases, folks don't tend to use the video feature. My advice is to always enable your webcam, even if you are the only one on the call that does. You'll find that if you switch your camera on, other folks will do too and then you have a video call rather than just voice which is much better in lots of ways. Having a video call is so much more personal than a voice-only and it helps you build a greater connection with your co-workers. Video calls also give you the opportunity to use body language to communicate as well as just your voice, which is very useful when you are trying make a point on a call but don't want to rudely interrupt ... I have literally held my hand up before to get attention, and it works! One of the dangers of home working is avoiding distraction and focusing on your work. Many of the tips in this article will help avoid distraction but I find that music is really useful for getting into a zone of focus and concentration. Normally I like loud guitar music but when I want to focus on work, I find that especially designed 'focus' playlists from Spotify, Amazon, Deezer etc work really well. Just search for 'focus' or 'concentration' and you'll find something. I like Deep Focus on Spotify. This is another reason why investing in a decent set of speakers or headphones is a good idea. Working from home is great but even if you follow all the tips in this article, you will miss out on the human connection of being in a real office which can make you feel lonely and isolated. It helps if you make the time to visit your real office on a routine basis even if you don't need to. This lets you make connections and have the ad-hoc conversations you may not have if you just work from home. In my team (who are primarily remote workers) we have the first Monday of every month as 'work in the office day' where everyone goes to the office, even if they don't need to be there. This is great for building a sense of team and caching up with folks informally. The world of work is changing and the concept of having to be in a specific place at a specific time is thankfully disappearing. However we now face new challenges of loneliness, isolation and lack of connection to our co-workers which we need to consciously put effort in to overcome. Working for home takes practice and discipline to get right. I hope these tips are helpful to you, I'd love to hear your own suggestions if you have them.